The Strip fills with revelers. Fireworks light up the sky. The casinos are body-to-body, the showrooms filled with A-list entertainers and Vegas is more gloriously alive than you've ever seen it. 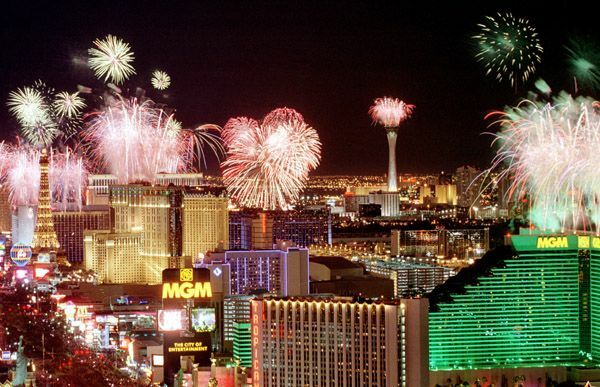 New Year's Eve in Vegas is a world-class celebration. All major clubs require ticket purchase on 12/31. We will have VIP guest list available for the weekend leading up to NYE. More information about Las Vegas' 2012 - 2013 New Year's Eve celebration will be added as it becomes available. Book early and with Ultra Vegas - Hotel rooms sell out early and prices can soar for the holiday, so make sure to book your room as soon as possible to get the best prices and your first choice of accommodations. Beat the Traffic - If you're planning to party on the Strip, get there early, even if you're going to attend an event or party within a casino. Las Vegas Metropolitan Police shut down Las Vegas Boulevard (a.k.a. "the Strip") between Sahara Avenue(Stratosphere and Russell Road(Mandalay Bay) to cross-traffic as early as 6 p.m. If you decide to stay on the Strip, the best ways to get around on New Year's Eve are by taxi, walking or using the Las Vegas Monorail. Leave your car at home or in hotel garage/Valet. Indoors or Outdoors - This is Vegas and while the sun is almost always shining during the day and the temperatures can be quite pleasant, it is still the desert and it does cool off at night, so be prepared if you're going to join the party outside on the Strip. Be aware that if you're trying to get into one of the jam-packed hotels on New Year's Eve, you could run into difficulties. A number of Strip hotels, in an effort to keep drunkards from the strip from bothering hotel guests, will allow only those with proof they are guests of the resorts to enter the properties during the height of the festivities outside. Get high. Really High..and by that we mean get to the highest possible vantage point that you can find. Fireworks ringing in the New Year here are a great New Year's experience. But if you're sausaged between a bunch of people and bunch of tall buildings on the street, you're not going to see much, so check out places like Ghostbar or Moon rooftop clubs at the Palms. Do not climb a lamppost. Those people make the news (and the trip down to the police station) every year. Don't wait!!! Click Here to plan your Ultra Vegas New Years trip now so you can focus on other things like who will be your midnight kiss!